HP Inc. will be updating three devices in its commercial EliteBook line this week at the Consumer Electronics Show, each falling in a different place on the spectrum between notebook and laptop. In a call with press on Monday, Mike Nash, vice-president of portfolio strategy at HP, said that the new products were addressing the largest sub-segment of the workforce, which is also the fastest growing. Millennials are increasingly represented among IT decision makers. “As the millennial customer becomes much more a part of the workplace… we find that work is longer a place that you go, but something that you do,” he said. Nash shared a slide of statistics showing that millennials now compose 34 per cent of the labor force. Teleworking increased by 80 percent between 2005 and 2012, and even when people buy portable PCs for their personal use, 80 per cent say they intend to use them for work at least some of the time. 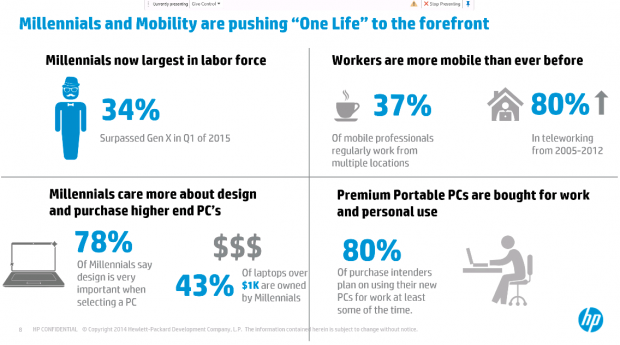 So as you might expect, HP’s new laptops are geared towards mobility. Plus, Alex Cho, vice-president of commercial products at HP, says the firm worked with Microsoft on optimizing the products for use with Skype for Business on the HP EliteBook Folio. “This device is really made for people using their notebook all throughout the day conferencing and calling people,” he says. Presumably those capabilities will also be reaped by those using web conferencing software of all sorts, as “40 per cent louder audio” and “built-in collaboration keyboard” are the features listed. This device will be just 15.8 mm and now features the new HP premium keyboard and ClickPad (a wider track pad than previous versions). It has optional LTE connectivity and can be used with enterprise docking stations. It will have a USB-C port specifically for charging, and support HDMI output. There are security features such as a fingerprint scanner and smart card reader. The battery life is estimated by HP to last up to a very specific 10 hours and 15 minutes. This laptop will be available sometime in January, starting at $1,199 USD. This is the device that HP says it designed for millennials. In terms of actual hardware specs, that translates into a 12.4 mm thick laptop that weighs less than a kilogram. It has 40 per cent louder audio (presumably compared to the previous generation Folio) and battery life than can last up to 10 hours of use. The display supports an Ultra-HD 4K resolution. Notably, HP compares its Folio directly to Apple Inc.’s MacBook Pro. The new Folio will be available in March, starting at $999 USD. A more traditional laptop, this also has some more powerful internal specs with Intel Core processors, AMD R7 Radeon Discrete graphics, and a QHD/UHD or FHD touch screen. It’s spill resistant, has a backlit premium keyboard, and a full-sized VGA port. This one will be available in January starting at $949 USD.